Composting is an environmentally beneficial activity and good business! Several regulatory permits and issues must be handled in order to operate legally. The Washington Solid Waste Handling Standards (WAC 173-350) that went into effect February 10, 2003, apply directly to composting facilities. Under these regulations, operating and permitting requirements vary depending upon the feedstock type and quantity of material you will be processing. Benefits of operating under a permit include the ability to meet WSDOT specifications for erosion control media, and the potential for listing in WSDA’s Brand Name Material List as an approved Organic food production amendment. “Full Circle” Composting in schools provides a hands-on experience for students to learn and to apply lessons in ecology, biology, microbiology, botany, chemistry, soil science, nutrition, food production, weights & measures, Scientific Method and more! Such a program helps schools reduce the wastes generated and increase the sustainability of the facility. It reduces the carbon footprint of the school, and provides opportunity for community interaction. 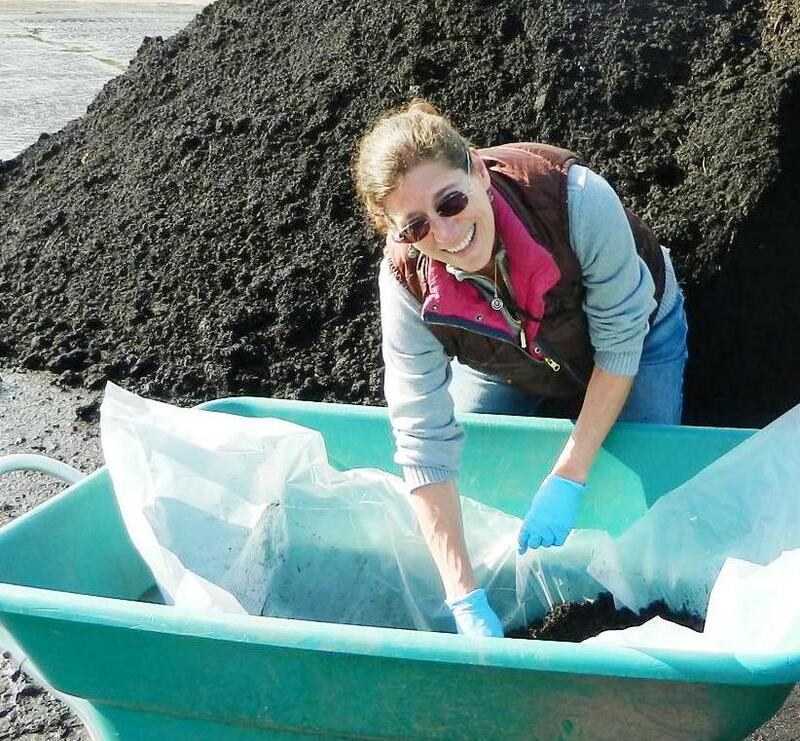 present the benefits of ‘Full-Circle’ composting programs and help teachers with technical questions about composting and all of the subjects that students can learn from composting. Terre-Source helps composters produce high quality compost products by providing expertise in the composting process. We can help you meet your client’s specifications and increase your market! Compost is becoming recognized as an important source of organic matter and slow-release nutrients for Organic and conventional agriculture. Organic farmers have the added burden of needing to report all inputs to show that they meet the National Organic Program’s requirements for Organic Food Production. Several entities will register your compost products for use in Organic agriculture minimizing the risk for the farmer, which makes your compost more valuable: The Washington State Department of Agriculture maintains a “Brand Name Materials List” of products that meet those requirements. OMRI maintains a U.S. and Canada national listing for materials complying with the National Organic Program. Having your compost product listed on those approved list(s) can increase your market for finished compost and establish your product in the new and growing arena of organic agriculture! “Reduce – Re-Use – Recycle – Re-Buy!” is even more important as society realizes the impact of continuous extraction of resources to produce items we use daily. From reducing our carbon footprint to energy costs of production and ecological costs of producing raw materials, society needs to use materials more wisely. Terre-Source can help companies and governments implement recycling programs for landscaping wastes, food wastes, and other organic materials, as well as more traditional recyclable materials. We can also help investigate uses and re-uses for other waste products to create innovative and cost effective recycling programs. Composting uses biological processes to heat and degrade organic feedstocks to produce a biologically stable, humus-rich, beneficial soil amendment – Compost! Optimizing the microbial processes in composting is similar to raising crops and larger animals. A farmer must provide for his or her animals’ needs such as food, water, and environment for them to thrive and reproduce. The compost facility Operator is essentially a ‘microbe farmer’ who must provide those elements for his or her biota. Because any biologic system is necessarily complex, the operator must pay constant attention to the “behavior” of the system. Ultimately it is the Operator who most influences the success of the process. The skill and expertise of the Operator is, therefore, critical to the success and ultimate production of high quality compost. Terre-Source works with WORC’s Compost Facility Operator Training as well as providing on-going consultation on all aspects of the composting process and compost facility set up. Composted organics provide microbial, chemical and structural benefits to stripped sub-soils when a compromised site is being restored. Former mine sites, gravel pits, industrial spills/leakage, as well as wetland areas and parks all benefit from use of compost to restore soils and protect plantings from desiccation. Use of compost blankets as erosion protection is also used to help keep soils and seeds on a slope long enough to establish. Compost and composting can be used beneficially to remediate a number of different types of contaminated sites. Composting uses the biological system of micro-organisms in a mature, cured compost to sequester or break down contaminants in water or soil. Micro-organisms consume contaminants in soils, ground and surface waters, and air. The contaminants are digested, metabolized, and transformed into humus and inert byproducts, such as carbon dioxide, water, and salts. Compost bioremediation has proven effective in degrading and/or altering many types of contaminants, such as chlorinated and nonchlorinated hydrocarbons, wood-preserving chemicals, solvents, heavy metals, pesticides, petroleum products, and nitrate based explosives such as TNT, RDX, HMX, as well as PAHs, PCPs and other VOCs. The US EPA has published information on innovative technologies including bioremediation and pollution prevention and composting of explosives contaminated soils. Compost is also being used as an innovative technology to clean up land contaminated by hazardous wastes, remove contaminants from storm water, facilitate reforestation, and restore wetlands and other natural habitats. Compost has been used to restore soil that is contaminated with explosives, munitions wastes, petroleum, fuel wastes, and lead and other metals.